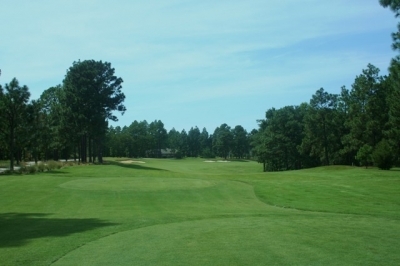 PINEHURST, NC – Many people would say the golf industry’s gone through a rough stretch the past couple years, but golf architect Tom Fazio says it was just as bad, if not worse, in the mid-to-late seventies. Seeing as Fazio’s a historian in the business of golf design, he should know – and he says it was getting a call one day in 1976 from the management at Pinehurst Resort that helped turn things around for him and his uncle (George Fazio), when they were offered the chance to design Pinehurst #6 – the first course at the legendary golf resort that was to be built away from the main property. 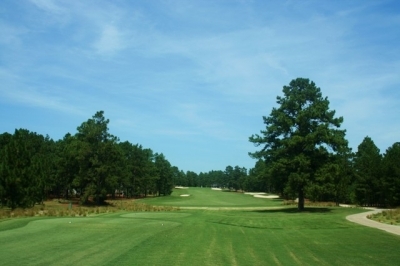 Pinehurst #6 won't ease you into the round, as the par four 1st hole is rated the most difficult on the course. “Then the people at Pinehurst called, saying they were planning to do a sixth golf course. Most people think Donald Ross did all five of the original golf courses, so the new golf course would be the first non-Donald Ross layout at Pinehurst. It was a major deal – I felt it was the premier new golf course job in America at that time. Here we were, just coming out of a recession, and the opportunity to work at Pinehurst and establish your name next to Donald Ross – that really stands out,” Fazio remembered. 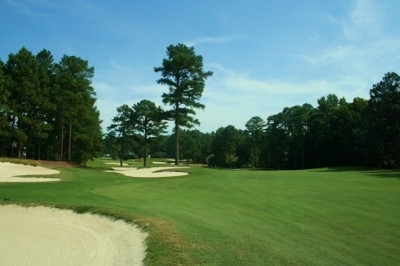 It’s true, the first five Pinehurst courses (including the famous #2) are based at the resort center – but there was another unique aspect of the Pinehurst #6 project, the fact that it was to incorporate real estate along with the golf course. There are houses on the periphery of the main resort’s courses as well, but this was the first layout to have an entire development play a role in the design. Good position off the tee is critical at the par four 17th hole to give you a good angle to approach the elevated green. The presence of a neighborhood surrounding the links isn’t the only thing that sets #6 apart from the ‘resort’ courses, its topsy-turvy topography also makes it distinct – and a large quantity of water dots the layout as well. The dogleg right par four 4th hole strongly suggests a fade off the tee. Fazio said that water just isn’t ‘necessary’ on a lot of golf courses, citing Pinehurst #2 as an example of a highly ranked course with little or no water influencing play (and Winged Foot as well). Some clients apparently have a problem with a dearth of water until they find out that several classic courses also don’t have it. But that wasn’t the case on #6, because the land set up for it perfectly. “We realized right off that the land was hilly, and in order to have hills, you have to have low points and high points. When you get to low points, they become natural locations for lakes. And when you incorporate real estate development and incorporate drainage, you certainly need ways to drain the property and also ‘stack’ water – to preserve it as well for irrigation,” Fazio said. So for those who think it was part of the grand ‘design’ of Pinehurst #6 to have a plethora of water hazards, you might be disappointed – Fazio said it was ‘logical’ to have it. There isn't much room to bail out on the beautiful par three 13th hole. 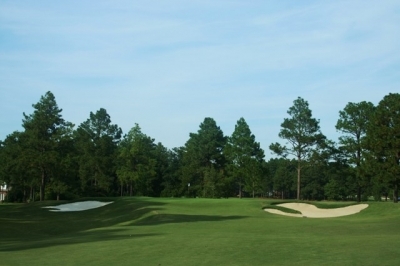 Whatever the reason, Pinehurst #6 has a distinctly different look and feel from the main resort’s courses, though there are, of course, the pines, pine straw and wispy grasses that all the layouts have. The elevation changes keep things interesting, and you’ll note them from the very first tee, which features an uphill par four to start off the round. It also should be noted that Fazio came in to renovate the course several years ago (2005), and he says they basically just did things to sharpen up the course in places that had changed since it opened over a quarter-century before. This pond near the green of the par five 6th hole is your first hint of water on the course - but you'd better be prepared to see quite a bit more of it. Thatch also builds up on turf and soil, which may even slow the surface of the water from flowing. Trees die, and others grow in. It’s a whole collection of things that golfers probably wouldn’t notice but need to be ‘corrected’ after a period of time – to improve the quality of the maintenance and playability. Not having seen the course prior to renovation, I can’t speak on the quality of the changes – though I can say the course was in excellent shape when we visited over the Labor Day weekend, which is typically a tough time of year to keep a golf course looking nice. Looking from behind the green of the long and challenging par four 10th hole - one you'll be glad to leave behind you when finished. 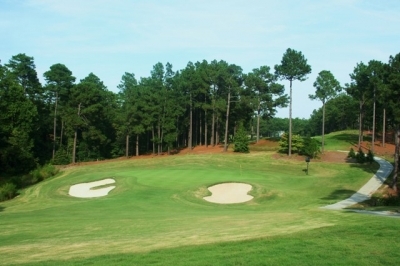 Another thing about Pinehurst #6 that stood out was its variety, and while every course’s staff would brag about the different nature of the golf holes, Pinehurst #6 has it built in – literally. “That particular piece of property is hillier than #2 and the other courses at the resort – so that’s one of the reasons people enjoy it,” Fazio added. 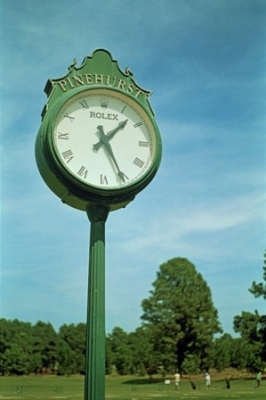 Like all the Pinehurst golf courses, these clocks will tell you exactly where you are. It is indeed. We were fortunate enough to play a few holes with a local resident member at Pinehurst, and he said that Pinehurst #6 is the members’ favorite course – not bad considering the line-up of courses that Pinehurst members can choose from (which does not include #2, of course). #6’s player-friendly nature is its most striking characteristic – like many Fazio courses, it looks harder than it plays. But it wasn’t always known as so welcoming. 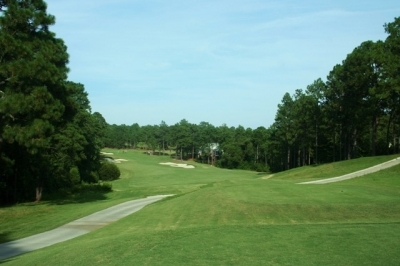 “In 1979 when it opened, Pinehurst #6 was a long golf course at nearly 7,000 yards and was touted as the most difficult in the area,” said Pinehurst’s Executive VP of Golf and Club Operations, Don Sweeting. The par three 16th hole offers a very wide target - but you'd better choose your club wisely to avoid the hole's pitfalls. Sweeting says the 2005 renovation eased some of the course’s original brutish challenge – the treacherous mounding in the greens was softened to accept approach shots, and the return of the natural sandy areas off the fairways became easier to hit out of than deep Bermuda rough. 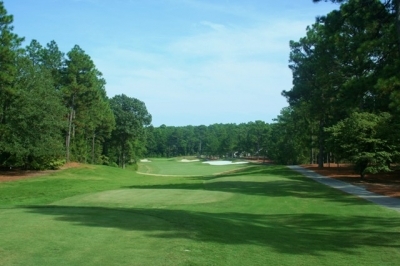 The visibility of the layout also helps players navigate a round – there isn’t really anything hidden about Pinehurst #6. Today, the course’s sharp doglegs (on holes 2,4,6,9,12 and 15) are its most difficult challenges – requiring a strategy of patience to play them as designed or a potential big number awaits on any of them. There’s also plenty of trouble waiting to the sides of the holes if you’re a bit wild – out-of-bounds, dense woods or deep greenside bunkers. Bunkers and pine trees guard against cutting the corner on the dogleg left par four 9th hole. Highlight holes included the par four first, which according to locals is the most difficult starting hole of all the Pinehurst courses (and the #1 handicap hole). The hole measures 441-yards and moves uphill from the tee shot landing area on – and there’s also out-of-bounds on both sides of the fairway. As if that isn’t enough, there’re fairway bunkers and two greenside bunkers guarding a two-tiered green. If you’re not careful, it can be a rough way to start, for sure. The par three seventh hole is also one you’ll remember, but for its beauty this time. 213-yards from the back tee, it plays slightly downhill to a green guarded by water in front and on the right side (and there’s a steep hillside to the left for those wishing to bail out). You’ll see the par four tenth hole driving onto the property and immediately notice the water – it squeezes the tee shot landing area (but probably beyond reach of most players). The second shot is uphill to a green guarded by a bunker on the left. 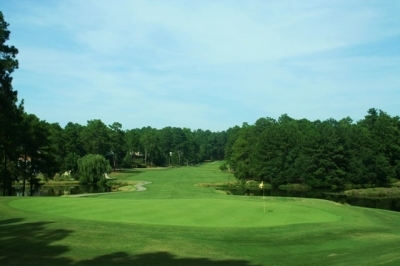 Both nines start off with difficult challenges, as the tenth is rated the #2 handicap hole. It's downhill off the tee of the par four 11th hole. Sweeting describes the 14th hole: “It has a unique view from the tee as the fairway is set elevated and substantially left of a large water hazard guarded by bunkers on the left and the approach is over a fairway ravine to the appearance of an elevated putting surface guarded by a bunker again on the left side of the green.” Yet another beautiful golf hole. Pinehurst #6 certainly is a fine compliment to the other courses at Pinehurst, and stands out as one of the most unique – an up and down, watery challenge that you won’t soon forget. It’s easy to see how the course helped bring back golf from the doldrums of the mid-seventies. One last challenge awaits you on the approach shot to the par four 18th hole. On our most recent visit to Pinehurst, we decided to stay a bit off the beaten path at a place that we knew would be convenient to all the golf courses we were going to play, would provide plenty of room for our group (which included kids), some peace and quiet, and most importantly, all the comforts of home. 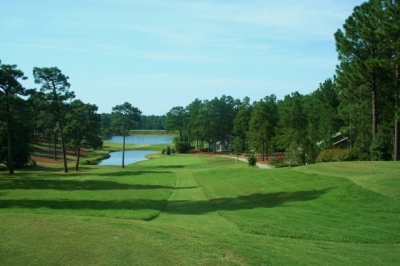 For that reason, we chose The Condos at The Pit (which was also one of the golf courses we played), located just south of the Village of Pinehurst and close enough to the area’s amenities -- yet far enough ‘away’ to make it feel like a real vacation spot. The Pit Condos are all located on the Pit Golf Course’s par three seventh hole, and are within walking distance to the clubhouse. These two and three-bedroom condos sleep two per bedroom (for golf groups) with two queen beds per room. There's a great view from the deck of the Pit condos. Each condo has a fully equipped kitchen with stainless steel appliances, flat panel TV in the den with VCR/DVD player, a TV in each bedroom, digital phone for free long distance, free high speed internet connection, full size washer & dryer, linens, towels, and a balcony with outdoor seating. We took advantage of the balcony to enjoy the pleasant early fall evenings – highly recommended! The kitchen facilities also helped us manage meal-time in a convenient, budget-conscious way. 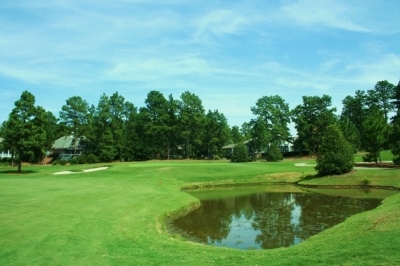 For condo rentals or golf packages, please contact Maples Golf Packages at 800-889-5323 or visit www.MaplesGolf.com. 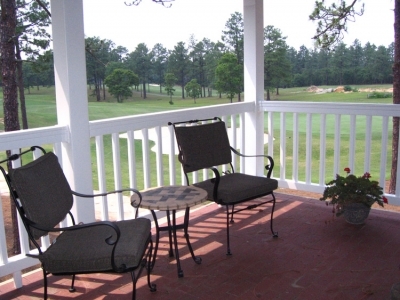 For current rates and packages, check the Pinehurst Website.